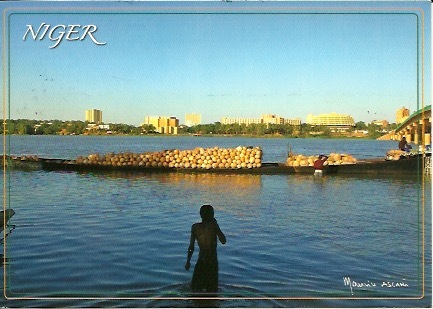 Africa-Niger-Niamey I love this card as this is the view I seen every day in Niamey. 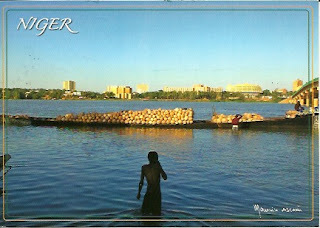 This is the river Niger and went down on a boat here and in Mali where the river runs through. Lucky enough to see Hippos on one of the trips. I show the whole back of the card so you can see the full postmark. Very efficient Post Office by West African standards. It was my last country to visit in Africa. So it was a great occasion to celebrate on the last night. You will note that I am still at this time waiting on my cards from Mali which I visited before Niger. 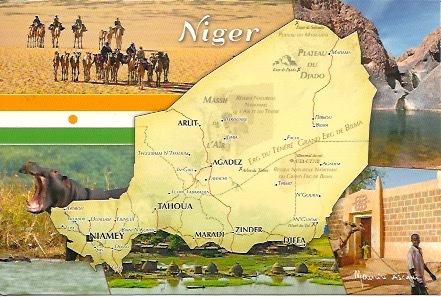 Africa-Niger-Niamey This card is showing a map of Niger. Could only visit Niamey on this occasion as the rest considered not safe enough at this time. Agadez would be the place to go. On the ground all was well here and enjoyed the city . The Main Post Office in Nimaey was very large and was the most modern of the 3 countries on this trip. Very clean inside. They even had a "Philatelic Counter" , though I suspect the lady at the counter had not served anyone in a long time. The regular counter had a better selection of stamps. No sets just lots of individual stamps. 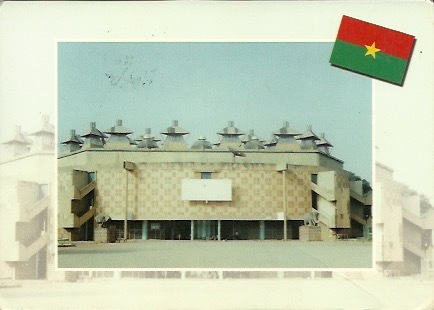 Africa-Burkina Faso-Ouagadougou This Postcard is showing the House of the People which is the Parliament Building . It was difficult in Ouagadougou to see Government buildings as some the roads were closed off , I suspect for security reasons. God this card from the local postcard sellers outside the Post Office. 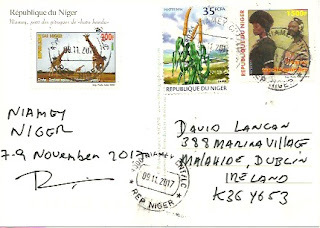 These were some more stamps I had to get from a local outside the Post Office due to it being closed for 3 days when I was here. One of the days it was due to close but my guide was surprised as to the reason. The value on the stamps are quite low compared to the cost of postage in the other countries I visited. So I wonder if it is the real cost. The man selling me the stamps told me that is the price. The stamps date from the early 1990s. 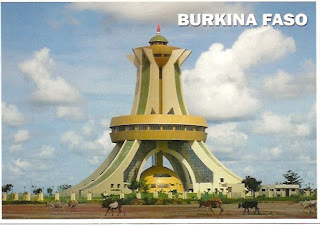 Africa-Burkina Faso-Ouagodougou This is the monument to National Heroes in the Capital city. In fact I never got to see this. I believe it is in a field . But still enjoyed my visit here. The best thing was the houses in the countryside . I will publish photos of those soon. For the three days in was in Ouagadougou the Post office was closed. It was a holiday on one of those days but I did not know it was closed two days after this. Either did my guide or hotel I was staying in. So was not too happy with that. I had no stamps but I was able to get a few stamps from a Postcard seller outside and these are the stamps that are used here. I did not get inside and posted them in the mailbox outside. Please they got back here.